Malevich with GINKhUK employees in Leningrad. 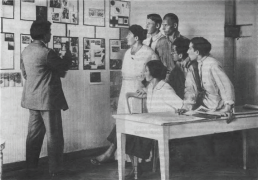 L-R: Malevich, V. Yermolayeva, K. Rozhdestvensky, sitting: A. Leporskaya, unknown, L. Yudin. State Institute of Artistic Culture [Gosudarstvennyi institut khudozhestvennoi kultury]. Located in Petrograd / Leningrad, originally within the Museum of Artistic Culture. Established in spring 1923, formally authorised in 1924. This page was last modified on 23 September 2016, at 09:30.